Long ago, bureaucrats began dreaming of the day when the complete transaction records of every citizen would be available for review. Cash had been souring those dreams. Individuals used it routinely and enjoyed the ability to buy and sell in confidence. So the war on financial privacy was launched in 1970 with the Bank Secrecy Act. It targeted cash specifically by requiring banks to report transactions involving more than $10,000. Politicians sold the law to the public as an important tool for thwarting drug dealers and tax cheats. Fast forward thirty years to the turn of the century, and the vilification of privacy was all but complete. Electronic payments — credit cards and debit cards — had become standard. Anything not paid for with a card, especially larger purchases, tended to be handled by check. So walking into, or out of, a bank with a large amount of cash was highly unusual and sure to arouse suspicion. By and large, however, bureaucrats remain focused on the banks as a cornerstone in their plans. Reliant on bureaucrats for taxpayer bailouts when things go bad, bankers have a long history of cooperating with the federal government (and vice versa). They have the records, and, in the modern age, people find banks just about indispensable. This opens up all kinds of new possibilities. You see, bureaucrats aren’t just dreaming about total information. They’re dreaming of total control. And they aren’t necessarily going to bother with a public forum, such as Congress, to get it. 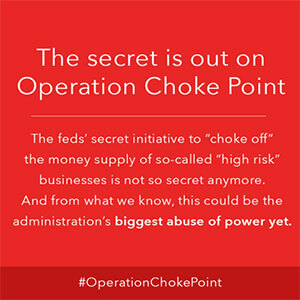 The Justice Department launched Operation Chokepoint in 2013. The strategy is to threaten banks with increased scrutiny, regulation, and penalties if they do business with certain companies deemed by the Department to be higher risk for money laundering and fraud. They want banks to give extra hassle to along list of merchants including gun shops and precious metals dealers, but they have been avoiding talking about why. Bureaucrats have moved beyond simply vilifying cash to vilifying entire industries. They are making real headway. Gun store owners in Wisconsin and Massachusetts are among those who have taken a call from their squeamish bankers telling them their accounts will be closed. Because of all the extra regulatory burdens, the bank no longer wants to do business with people like them. You start small. People doing reportable cash transactions with their bank in 1970 were a relative few — $10,000 was a lot of money back then. Don’t worry about public opinion or inalienable rights. If, for example, circumventing the 2nd Amendment with a public battle to pass gun control laws is extraordinarily difficult, find another way to skin that cat. 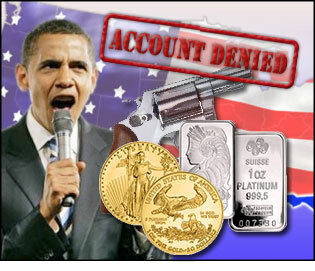 Make it difficult for people in the gun business to operate by limiting their access to banks. Just threaten any bank or merchant who thinks the public should know what regulators are up to. Tell them to be quiet — it’s in the interest of national security. Violators will be punished. The war on financial privacy may have begun slowly more than 4 decades ago. But events are rapidly escalating now. Be vigilant and prepare accordingly.